There were so many aspects of The Tombs that urged me to pick it up. The setting is a fantasy world blended into the real NYC of 1882, a time after the civil war where racial segregation is still quite prominent. In this fantasy world there are people with unique powers, powers they must keep hidden because seemingly lurking around every corner is a scary doctor and his men wearing crow masks, ready to take you away to an asylum called the Tombs at the slightest inclination of a power. 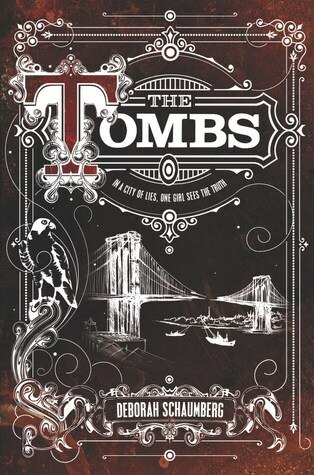 With a tenacious main character out to rescue those she cares about in the Tombs, this was one book to check out! I found the world building to very interesting. I love the blending of real and fantasy together in a way that felt like it could be true. The city details were very vivid and bold. The streets and factories especially. There are airships and even touches of steampunk thrown in as well. The hospital itself was very mysterious and sort of eerie. The evil doctor and his crow men were quite scary and revolting, giving my the heebie jeebies. There was a method to his madness, his big plans meant to control and to further the divide between races and nationalities. I loved the character of Avery. She is very confused and scared at first, in need of guidance when suddenly her own powers develop. When she gets herself into trouble and in the sight of those who want to lock her away, like her mother, she must learn how to use and control those powers in order to save those she cares about. She is the protective type who is just super compassionate and selfless, which we get to see time and time again with the kids she works with at the factory. She becomes quite unwavering in her determination to break out her mother and friends from the asylum and is willing to risk it all to do so. With so much to enjoy there were a few things that brought it down a little for me and mainly it was the slower pace in the middle. It dragged quite a bit and I was anxious for some action to perk it back up. There were also a few characters in the mix that had an important place within the story but I just never felt were hashed out as well as they should have been, mainly Khan, Avery’s best friend. And then Indigo who we barely know at all. This was especially bothersome since a love triangle-ish type situation sort of arises between them all and it just felt very thrown in and unnecessary. The story ending was explosive and exciting yet left quite a bit unresolved. I’m assuming and hoping a sequel is in the works to close those holes up. I can only imagine what will be in store for these characters in the next installment. If you are looking for something unique and different than this is worth checking out! Deborah Schaumberg’s debut novel — THE TOMBS– is a historical fantasy about aura seers. It has a hint of steampunk and an evil doctor. She grew up in New York, and now lives in Maryland with her family and two big dogs. I’ve seen this around and I’m really intrigued. Worried about the slower pace so maybe I’ll see if my library has it! I’m a slow reader so a slow pace always gets me hard but it might be better for you! Gangs of New York meets Cassandra Clare in this debut YA fantasy set in 1882 Brooklyn. Really? haha. Not sure if this is my book, the description does make me curious to read it. I do like something different (unique). I might give this one a try. Right? That tagline really drew me in. I just got this book and can’t wait to read it for my debut author challenge. I love your description of the ending and now I can see if I feel the same way about the lack of character development for some as well as the dragging part.